Villa Lazy Heart offers ten beautifully appointed air conditioned bedroom with en-suite bathrooms spread out in separate, independent cottages that surround the house. Each cottage suite offers comfort and privacy for up to twenty two guests. 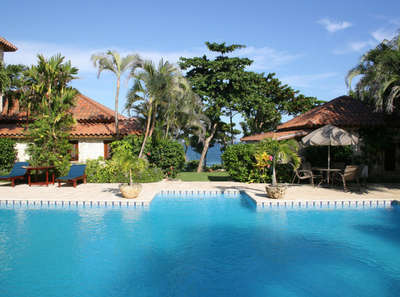 Villa Lazy Heart is one of the most exclusive luxury vacation villas in the Caribbean. This stunning ten acre property features nine cottage suites, Caribbean landscaped gardens, private beach access, a large heated swimming pool and Jacuzzi, hard clay tennis court, entertainment center, and eight horses to ride. Cabrera has become increasingly popular because of it is unspoiled white powder-sand beach and the incredible Robert Trent Jones designed 18 hole golf course. The course was designed to take full advantage of the area's beauty with ten holes following the cliffs overlooking the incredibly blue Atlantic Ocean below. Here, you will find some of the most exclusive private villas in the country. The city of Cabrera is located between Rio San Juan and Nagua on the pristine northern coast of this paradise island about 90 minutes from the Puerto Plata (POP) airport, and only seven miles from the famous Playa Grande Golf Course. Playa Grande Beach was rated as one of the top ten most beautiful beaches in the world by Cond Nast travel magazine. The big waves this area enjoys makes it a popular spot for surfing and body/boogie boarding. Just behind the beach are a number of food vendors who vie to be the first to offer you their freshly prepared seafood dishes and refreshments, served on tables in front of their establishments, or brought right to your chair on the beach! Whether you want to relax in a private villa or just explore the countryside on an ATV or by horseback, there is something for everyone in Cabrera. Fax machine and printer available. $140 from Puerto Plato International Airport. $160 from Santiago International Airport. **Children under five eat free.